If you come to Bali, we will take you to nice place in Bali. We have packages for Benoa waters sports, Bali Rafting & Bali Car Rental with Driver. If you plan to spend the long holiday in the most attractive island in Indonesia, Bali would be the best tourist destination to drop by at. The amazing panorama either on or under water has successfully gained the attention from the tourists across the face of the earth. One of the must-to-visit Bali’s destinations in your holiday is the north part of Nusa Dua Tanjung Benoa that offers you with the challenging water sports and the unforgettable Bali Parasailing Adventures. As long as you enjoy the activities and the world class water sport facilities during the holiday accompanied by the professional staffs, the amazing adventures such as Bali Parasailing Adventures will not easily be forgotten during your life span. What the Bali Parasailing Adventures offers to the visitors is the breath-taking panorama of Tanjung Benoa beach and nusa dua beach from the above. It might be look so scary for you who have not ever tried this water sport, but the staffs give you guarantee 100% safe as you fly together with 2 or 3 persons. It is because the activity is equipped with the standard safety equipments. In addition, your adrenaline will be pumped up for 6 fly, so this activity is strongly recommended to those who damn love outdoor activities. Location : Tanjung Benoa Beach. Tanjung Benoa flyboarding activity price is for one person. 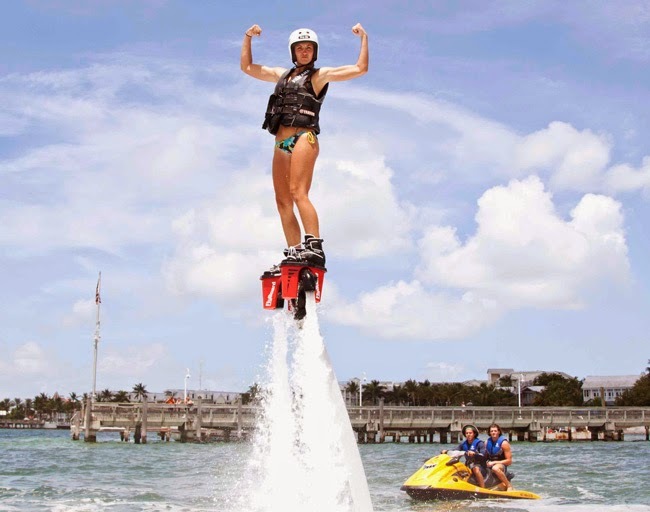 Flyboard publishes price is the price that customers will obtain. If customers make a walk in booking at the location, without creating advance booking with us. Customers will obtain Tanjung Benoa flyboard online price if customers make Tanjung Benoa flyboard booking with us. If you would like to have picked up and return transfer, free of charge. Only area Kuta, Nusa Dua & Jimbaran. Again, again and again that Bali is popular for the night life and the natural panorama that attracts both locals and foreigners to visit and stay for several weeks. Apart from its splendor, Bali is also well-known for its water sports, since Bali itself has many beautiful beaches with calm waves to rolling billows of the sea. No wonder if you find various water sports activities such as fly board Bali that spurs your adrenaline. If fly board Bali activity sounds strange to you, it is strongly recommended to visit Bali and try this water sport. In this regard, fly board Bali is one of the most extreme water sport activity with the fly standing board that will be pushed up by the high pressure of water force with 200pk connected with the jet-ski. As you fly with fly board Bali, you will be taken to 5-meter-high flight in the air or dive headlong through the sea water. If you are quite professional, with fly board Bali, you can fly at 10-meter-height. If you are not professional enough to do with this water sport activity, you are not necessarily worried since the staffs will assist you to do it. Many visitors are quite amazed on how easy to operate the fly board. Some of newbie spend their learning time in water for 5 minutes and for 15 minutes later; you can take a control over the movements in the water. Thus, if you want to have this memorable water sport experience, it is suggested to go Tanjung Benoa Nusa Dua Bali. Various kind of water sports in Bali are main attraction for the locals and foreigners who damn love spending their money for pumping up the adrenaline. One of another water sport that deserves to try is named as Bali Wakeboarding Tour. Designed with the combination of snow board, water skiing and surfing techniques, this water sport is suggested to those with the adventurous heart. In short, this activity involves riding on the wakeboard in the water. 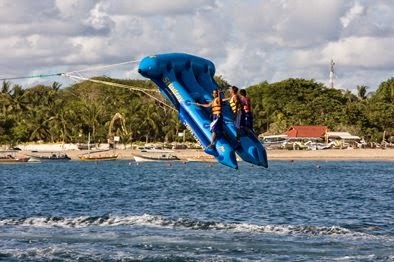 Located in Tanjung Benoa, this marine tourism activity will pull the participant at speed of 25 km/hours. If you want to go faster, it is suggested to pick the fastest speedboat, so that the wake-board you stand on will run fast. Bali Wakeboarding Tour is such a challenging activity where you are supposed to be in healthy and strong. It might be so hard for the inexperienced one, but with the brief information from the professionals before going for this activity, participants is also equipped with the safety equipments such as life-jacket so that it helps to survive when they fall into the water. The Bali Wakeboarding Tour takes only 30 minutes including the briefing and escorting to the location. To those who want to try this activity, you are supposed to prepare a good amount of money or around Rp 300,000 to Rp 450,000. What you can enjoy from the extraordinarily amazing water sport in Bali is something memorable during your life span. Below are some of other water sports in Bali. If you eagerly want to see the breath-taking view of underwater life without snorkeling deep inside or without being worried of getting wet, a new water sport in Bali named glass bottom boat tour will be the perfect option to take. It is because you will need to get onto the boat with the transparent glass. As the boat off ashore, you will make a halt for a moment in a certain site where various kinds of fish and other sea creatures live in. The tour of glass bottom boat directly heads to the turtle island tour where another beautiful life is preserved from possible danger. 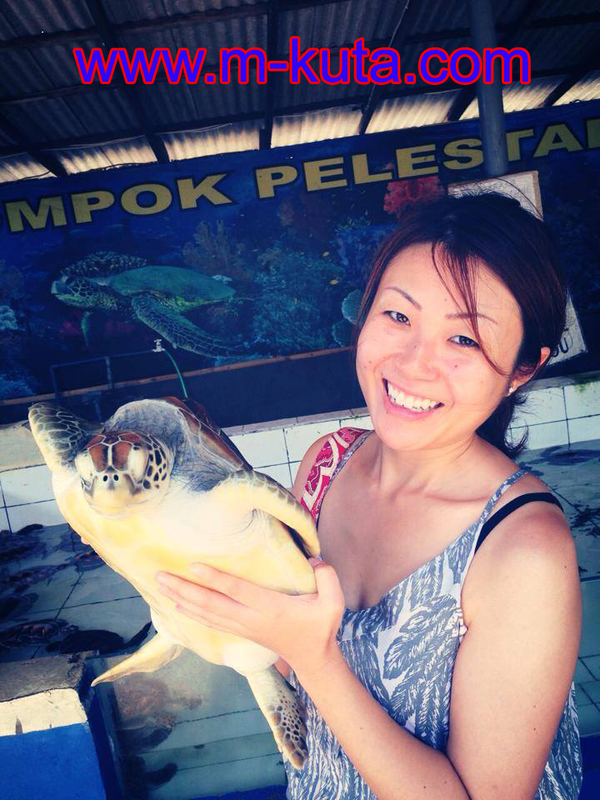 As you are quite satisfied with the glass bottom boat tour, you will be taken to the water sport in Bali named Bali Turtle Island Tour that will teach you about the life of the turtle. A small island where it becomes the turtle conservations, you will be close to the turtle. Some of visitors will capture the magic as they visit this conservation. Thus, if you are a kind of animal-lover, visiting this site is recommended. Do you love diving under the clear blue sea with the beautiful corals, reefs and various kinds of fish? If you said yes, it is recommended that you go for holiday in Bali. A land with many tourism resorts also offer you with the beauty of sea life. Thus, no wonder if many visitors prefer to take Bali diving water sports tour program to sitting on the sands for sunbathing. What the program offers to the visitors is about the tour activity package that will guide you to see the beautiful animal under the sea. One of the best site to dive is Tanjung Benoa Beach with the wave is not too fast and the environment is still virgin and quiet. 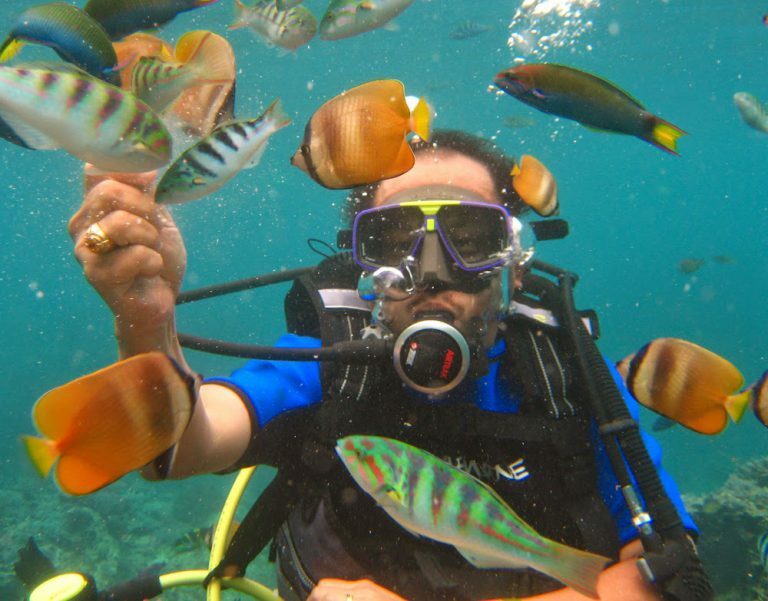 Widely known as the profusion of tropical marine life, Bali diving water sports tour program is something that will not put your life in jeopardy. It is because you will be briefed by the instructors and equipped with the safety equipments. Why beginner divers are suggested to visit Tanjung Benoa for enjoying the splendor of the underwater life is due to the ideal dive sites with the warm and calm water. Thus, if you want to take the Bali diving water sports tour program, it is urged to prepare for everything and the amount money to pay for the service. Some of you might be popular with the challenging water sport named banana boat. A sport that uses the yellow banana-shaped tube stabilized by the boat is now redesigned with the new look. With the donut-like shape, this tube still offers the exciting and fun water sports, since it still uses the boat to pull the tube that accommodates some riders. Later named as Bali donut boat tour, this water sport adventure only takes you around US$35 or around Rp 465,000 each person. With a big amount of it, you will be brought to the enjoyment and excitement for 15 minutes. Even though this water game begins to gain its popularity among the visitors, this Bali donut boat tour has been thought to be the must-to-try water game if you visit Bali. 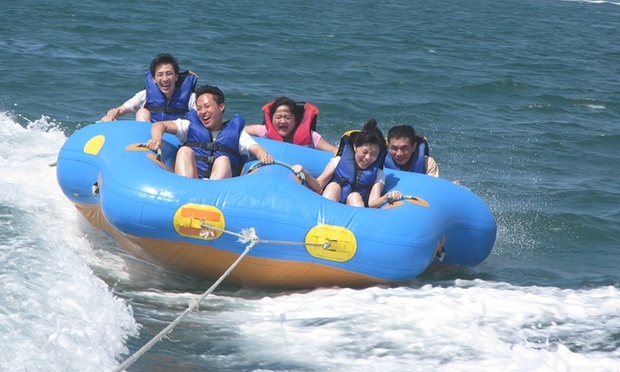 To those who are afraid to get onto the Bali donut boat tour, it is not a big problem since you are provided with the life-jacket during the tour with the Bali donut boat. In addition, as you pay for a great deal of money, it has covered the government tax as well as service charge. But, you will be charged for additional charge if you want to take the advantages of towel, underwater DVD and transport. One of the most important things about this activity is that the water sport has been covered by the insurance. The design resembles the fish because it is the joint of the three banana boat tube with the wing on the left and right, so that it looks like a fin. What you have to know about Bali flying fish tour is about the maximum number of the passengers is 3 persons. This is set to create the balance during the activity. In addition, thing to know is about the passenger position onto the boat is sitting like on the horseback or riding on a motorbike. How the Bali flying fish tour work does depend on the wind speed at that time. Since the fly fish boat is pulled by the speed boat, you are going to be taken from the beach to the sea. Then, the flying fish will fly over 2 meters from the seawater. But, if you have not ever tried this game, you are not necessary worried since the professional guide will explain you all about that activity. The splendor of the view under water the sea in Bali has been gained million attentions from the people across the face of the earth. No wonder if thousand tourists come to this island for a year to discover every corner of Bali for its beauty. One of the most attractive panoramas that the tourist will never miss to enjoy is the underwater sea life. Known as Bali ocean walker tour, this program offers the tourists who are not capable of diving and are curious enough to see the most beautiful corals, reefs and various fish with unique color. In general, Bali ocean walker tour is an activity to walk on the seabed while you and your partner see its splendor directly. It is not necessary to learn much more like diving activity, so that if you are a beginner for this activity with no diving experience, professional guide will help you happily. Unlike any other underwater activity that takes complicated equipments to survive during under the water, only water-resistant helmet is required. With 45 minutes including time for preparation and Bali ocean walker tour, you will enjoy 30-menit-walk on the seabed. Thus, if you want to try out, just prepare a good deal of money and make sure that you are fit at that time. No wonder some local and foreigner tourists who come to visit Bali will also prefer diving to sunbathing, since diving is thought to be the enjoyable activity due to some beautiful scenery under the water. One of the most recommended places to visit is Tanjung Benoa beach. 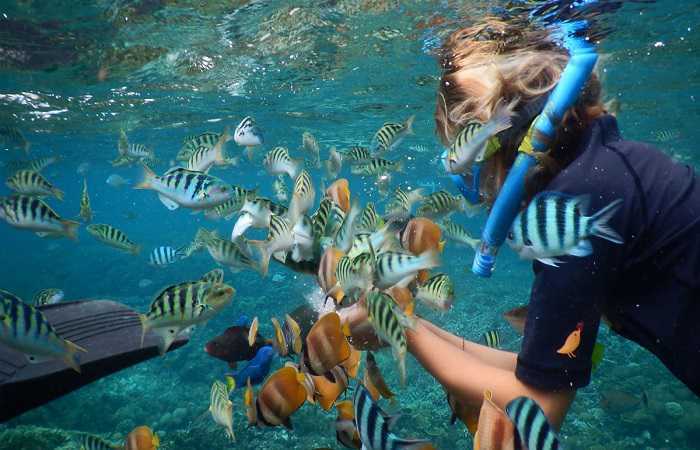 This Bali snorkeling tour will offer you an interesting package that equips you with the shaped tube for survival during snorkeling activity. In addition, you are also urged to use frog’s leg shoes and wet suits to prevent you from the jellyfish stings. This activity does not demand you to be able to dive, but make sure that you know how to breathe under water and how to stay afloat. What you have got to know about this Bali snorkeling tour is about learning how to breathe from the mouth. As all the equipments prepared, you are driven to the site where many ornamental fish and beautiful pristine corals live in. If your destination to go snorkeling in Tanjung Benoa, you should prepare a good deal of money or around Rp 170,000 each person. This price has included the service charge, tax and insurance. In addition, the visitors who are allowed to snorkel is between seven to sixty-five years old. As a change, you will have an hour-snorkeling activity and make sure you use moisturizer during take the advantages of Bali snorkeling tour. Ayung rafting – Own Transport is the very best choice to take if you really want to save more money. As you get the lower price, you will get the similar service in Bali ayung rafting. In addition, if you want to enjoy the long holiday with the most challenging marine activity, you just simply come to Kadewatan village. Having arrived in the location, you take the advantages from Bali ayung rafting and you just show the voucher card in the starting point so that you will be welcomed so warm and served with the beverages. Make sure that you do not completely forget to fill out the registration forms and insurance as well. 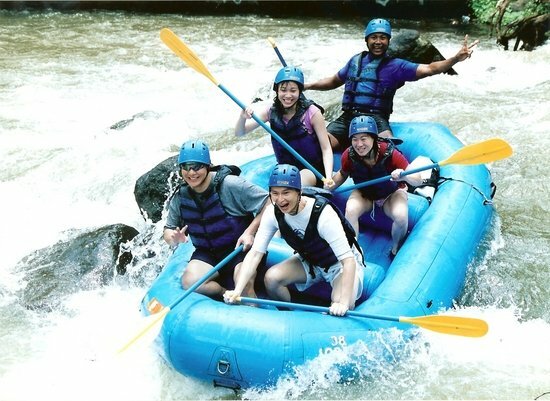 Before taking into the exciting activity, Bali ayung rafting also asks you to keep all the belongings to the locker. Make sure that you will not miss the personal equipment such as camera or money. As you have finished equipping yourself, what you have to do is going to the river side. When all members have gathered, the professional staff will guide you and tell you what you do and don’ts as long as the activity. In this occasion, you will spend 2-hours-rafting action. As you have finished from rafting, you are urged to go restaurant or going to shower at first. In addition, changing rooms is also available before lunch. Still, it is about marine activity that later is named as Bali Telaga Waja Rafting which puts the visitors to the challenging activity to conquer the longest river with the extreme current for rafting-lovers. Located in the Eastern part of Bali, precisely in Karangasem regency, you just need to take 1,5-kilometers-drive from Kuta. But, if you do not have any transportation, you can book the Bali rafting in the Telaga Waja river, so that the crew will pick you up in the location and return you where you belong to. As you challenge yourself in this extreme marine activity, you will be guided along the 16km of rafting route or it is equivalent with 2,5 hours rafting. 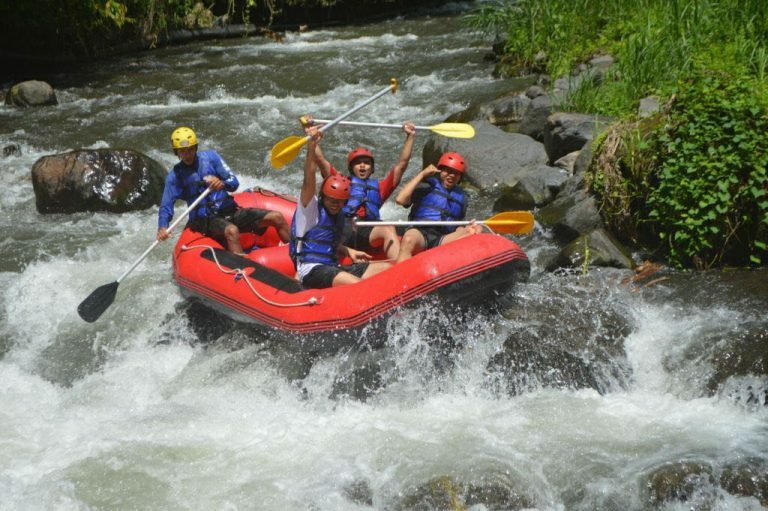 As long as the activity in this Bali Telaga Waja Rafting, you will enjoy the panorama of mountains, cliffs, rice fields along the rafting route. What makes you surprised and happy to try this activity is that you will find some waterfall that will splash you with its fresh water. Speaking about rafting grading, it is said that Bali Telaga Waja Rafting places its position between 2 – 4 grade class. Thus, if you damn love rafting, make sure that you drop by at here someday for the beauty and the wild current that dares you as true adventurer.